One of the bigger themes of many small business blogs and advice givers it to keep learning. But what does that really mean? 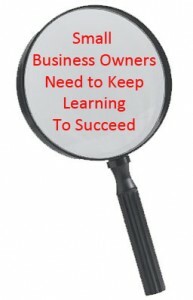 What do you as a small business owner need to learn? Learn more about your own product or service. Sounds simple, but after the initial launch of a new product or service, many small business owners forget what goes into accessing raw materials or the platform they are delivering it on. Learning more about the innovations in the manufacturing process of your product or the raw materials, can help you learn about finding new ways of improving your product offering. Watch what your competitors are doing. You may not want to copy or duplicate what your competitors are doing, but learning about how and what they are doing could help improve your processes, or even be a warning of what not to do. You want to learn about delivering your product or service the best way you can, without making costly mistakes that your competitors may have made. Learn about your customers’ business. This is not saying you should spy on them; it means that you should learn how they use your products in their business and who their competitors are. Learning about your customers will only improve on your business relationships and how you can better service their needs. This is more easily done by a small business with a smaller customer base than a large corporation with a larger client base. It will also improve customer loyalty because you better understand their needs. Learn about the problems that your customers face. By keeping up on social media and in-person communications with your customers, you will learn about the changes in their industry and marketplace. It could be as simple as changes in the way inventory is held or accounting practices. If you are able to adapt faster than your competitors, you will get the business from those customers. When was the last time you learned about that latest social media platform your customer are on? Most small business owners are getting engagement on Facebook, Twitter, LinkedIn and Google plus. But what are the new platforms that you should be looking at? Quora is on its way to becoming a great medium for small businesses to build their brand image by answering questions and being perceived as industry experts. Yelp is no longer just about a place to post restaurant review. People could be posting reviews of your small business there too. Even learning about things that are not industry-related or business-related can help you. You would be surprised how many professionals learn about topics that do not relate to their small business – but can still help them to improve. For example, last year one of our office space tenants took a seminar on teaching women how to understand football. She not only learned about the sport, but also the reasons behind most people’s passion for sports in general. She also got a chance to spend more time with her husband while enjoying the game. Nut most importantly, she gained new respect from her male clients for her knowledge of the game and its rules.